We have met and exceeded our goal! Thank you! We met and exceeded the required $3,000 fund raising challenge. on our Crowdrise page. The total raised was $3,726. Our sincere thanks and gratitude to everyone who gifted us. Your support means a great deal more than just dollars and cents. to know we have kindred spirits rooting for us. This picture was a gift from Morley and Bower Company builders to George Mason. One of many of the raffle baskets. There was an amazing variety of goods in those baskets. Thanks to all who donated for the raffle baskets. Our Keynote speaker Dr. Joseph Vaglica who is also the architect for the restoration of City Hall. A table full of amazing artists - all champions of City Hall. Blue Denim Ball of 2018 helped fund the restoration of these stairs. drawings and the intitial phases of a fire suppression system intallation . Our thanks to MCACA for their generous support. Before we can occupy the building we are required to install a fire suppression system (sprinklers) and a platform (porch) lift for ADA compliance. The cost is $96,000. We continue to have fund raisers and write for grants but we need your help too. 1. AmazonSmile: If you shop on Amazon consider looking at AmazonSmile. AmazonSmile is like a "branch" of regular Amazon and sells almost all the same products but donates a portion of a sale to a charity of your choice. Products on AmazonSmile do not cost more and Amazon does not charge any fees. Friends of City Hall is registered with AmazonSmile and donations for Friends have started to accumulate. AmazonSmile donates 1/2 of 1% of the price of your purchase. It seems a small amount at first but multiply that by many sales and a charity makes needed cash without cost or labor. If you are going to buy it anyway get it through AmazonSmile and be a Friend of City Hall. Simply type in Friends of City Hall when asked to name your charity. 2. PayPal Giving Fund: Friends of City Hall is a registered charity with PayPal Giving Fund. You may make donations at this site by typing in Friends of City Hall, Marine City, Michigan or by simply browsing charities by interest or state. PayPal charges no fees to either the charity or the donor. We have received almost $800 from supporters via this platform. The Historic District sign was erected August 23, 2017 and has garnered quite a bit of attention. Friends of City Hall is pleased to be able to share some of the history and achievements of Marine City. We welcome your contributions to assist us with this expense. Although City Hall has been on the National Register of Historic Places since 1982 vedry few people knew about it. Friends of City Hall hope this investment will do a good job speaking for the building and telling of its place in history. In 1981 a representative of the Michigan State Historic Preservation Office (SHPO) came to Marine City to analyze City Hall and do research on its history. 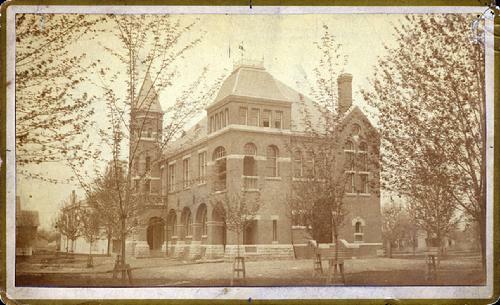 An application was then written and submitted to the United States Secretary of the Interior requesting City Hall be added to the National Register of Historic Places. That application was granted and City Hall was placed on the Register in 1982. A copy of that application and the acceptance letter are on file with city government. A few people who know some of the history of City Hall are aware of its placement on the Register and Friends of City Hall makes a point to mention this honor wherever possible. But, there has never been an effort to memorialize this special status with any kind of sign or plaque. The general public and casual visitors to City Hall do not learn of this. In 2008 Heritage Square and City Hall became the first Historic District in Marine City. However, no effort was made to erect an Historic District sign. Historic Districts are a matter of community pride in the history and culture of its past. Having an Historic District identifies a community as aware of its heritage and mindful of preserving it. Of course Friends of City Hall makes constant mention of the Historic District but a formal, permanent sign is truly what is required. Neither the federal government or state government pay for Registry plaques or Historic District signs. To correct these oversights Friends of City Hall has started a fund raising campaign to purchase and install a bronze plaque on City Hall which will tell of its listing on the National Registry of Historic Places. In addition, a traditional Historic District sign will be purchased and installed to face the street. Bronze was chosen for its durability and lasting beauty. Both the plaque and the free standing sign will be illuminated at night. If you agree that City Hall and Marine City needs and deserves this recognition please make a donation to Friends of City Hall to help fund this signage. Friends is a 501 (c) 3 corporation and all donations are tax deductible. Your gift of $10, $20 or more will be a big help in completing this project. Please write 'Plaque' on the memo line of your check. Save your check and stamp and donate by PayPal below. It's fast and easy to contribute online today! To see more photos of the restoration process see the Restoration page. South facade of City Hall with damaged bricks removed. Bit by bit, as the sealant is removed and the damaged brick taken away, the grand old gal is beginning to tell us fascinating snippets of her life story. The most surprising so far is what we are learning about the brick laying technology employed in her construction. Removing the outer layer of brick revealed no air gap/weeping space between the inner core of bricks and the skin. Instead, a very unique bonding method was employed. Where ever you see a row of darker, more reddish brick, it is the site of a clever technique for uniting the core to the skin, i.e. a bonding of two wythes (widths). Those darker red bricks are shaped to have a point jutting out the back. Bricks of the same course in the inner wythe are set in on a diagonal to form a v shape recieving gap. You can see a partial row of this "dog tooth" technique to the right of center in the photo. Just above you can see the end of a newly revealed iron restraining rod. This one was not decorated with an escutcheon (decorative face plate). To see more pictures of the restoration go the the Restoration page.